The 1940s were a decade of tension and transition. Millions of American soldiers left for World War II, and with them went men and women journalists  most notably the "Murrow boys." Edward R. Murrow, made famous by World War II, began a transition from radio to television. It was the golden age of comic books. While print media were enjoying success, the war thwarted expansion of broadcast media, especially the new technology of television. The Federal Communication Commission forbade the creation of new radio and television stations during the war years. The 1940s also saw the death of the beloved Franklin Delano Roosevelt, and the fall of both Mussolini in Italy and Adolf Hitler in Germany. From the embers of the Second World War came the "Cold War" a simmering competition for world dominance between the democratic, capitalist United States and totalitarian, communist Soviet Union. Shirer was recruited by Murrow in 1937. As a CBS correspondent in Berlin, he witnessed the Nazi's rise to power firsthand. He wrote several books about his experience, including Berlin Diary and This is Berlin: Reporting from Nazi Germany. The Rise and Fall of the Third Reich, published in 1959, is still one of the definitive histories of the era. Sevareid joined the "Murrow boys" and reported on the war from Europe, Asia, Africa and Central and South America. Sevareid reported on the fall of Paris, and landed with American troops at Omaha Beach, and once had to parachute in the Burma jungle when the plane carrying him experienced engine trouble. Sevareid's career as a news analyst extended into the 1970s and he worked for The CBS Evening New as a national correspondent. Nicknamed "Bonnie Prince Charles " because of his pretty boy looks and extravagant lifestyle, he was sent to cover operation "Torch" in Africa. Collingwood was Murrow's protégé, and eventually replaced him on Murrow's television hit Person to Person. Collingwood defended fellow broadcasters accused if communist sympathies during the Red Scare of the 1950s. Lesueur, the forgotten "Murrow boy," was a rough and ready journalist. He covered the London Blitz on CBS's London After Dark, and also traveled to the Soviet Union to cover the eastern front. Lesuere covered the liberation of Paris and the liberation of the Dachau concentration camp. He would later leave CBS to work with Voice of America. Smith began his career as a foreign correspondent for United Press in London. In 1941, he joined the "Murrow boys" in Berlin. After the war, he worked for CBS's Washington bureau as chief correspondent and general manager. He left CBS and later became an ABC anchor and a moderator for Face of the Nation. Brown covered Italy, Yugoslavia, North Africa and the Far East as a "Murrow boy." While reporting from the H.M.S. Repulse, Brown was forced to abandon ship when Japanese airplanes sunk the battleship. Brown would survive and wrote a book recounting his escape from the sinking Repulse and long return to England. However, Brown became unpopular with the CBS management for his outspoken criticism of war-time censorship. CBS later fired him for editorializing on air. Burdett began his career at the Brooklyn Daily Eagle, and was eventually hired as one of the "Murrow Boys." He later confessed to being a Communist spy during his early war career. In 1955, he willingly testified about his Communist past to the House Un-American Activities Committee. CBS and Murrow protected Burdett and assigned him to Rome where he finished his career. Breckinridge began her career as a photographer and videographer. During World War II, she was hired by Murrow as the first woman correspondent for CBS. Her career was short-lived. After her marriage to American diplomat, Jefferson Patterson, she was forced to retire from broadcasting. She quickly switched roles and became an active and social diplomatic wife. Pyle worked as a war correspondent during World War II and accompanied Allied troops in North Africa, Italy and the Pacific. He was awarded the 1944 Pulitzer Prize for distinguished war correspondence. Pyle was known for his ability to bond with the troops and to capture the real emotions of the war. His account of the death of Captain Henry T. Waskow exemplified his skills as a writer. Bourke-White was born into a family that embraced female equality and ambition. She was a pioneer in the field of photojournalism. Many of her photographs appeared on the cover of Life magazine, and she provided the American people with a grim, visual reality of the war. An independent and determined woman who wasn't afraid to take risks, she was the first woman to fly on bombing missions, and one of the first photographers to document the horrors of Nazi concentration camps. After completing a degree in journalism at Columbia University, Higgins was hired by the New York Tribune. She wanted to report on the war in Europe, but it wasn't until 1944 that she was finally allowed to go to London. She began by reporting on the war from France and later accompanied troops to the Nazi concentration camps in Dachau and Buchenwald. In later wars, Higgins also covered the fall of Seoul, Korea, and made several trips to Vietnam, where she was killed. Capa, already famous for his photo journalism during the Spanish Civil War, would cover one of the most important battles of the war, the June 6, 1944 invasion of Normandy. Capa would wade ashore with one of the first landing craft and snap many photos before returning to England aboard another landing craft. Most of his photos were destroyed while being developed, but 11 now-famous photos would be saved. The Los Angeles Times spreads the dispiriting news. Millions of Americans adored Roosevelt. They admired his strength and determination, and looked to him for support and guidance during times of crisis. His death on April 13, 1945, brought great sadness to the nation. An editorial in The New York Times personified the nation's shocked and sad reaction: "Men will thank God on their knees a hundred years from now, that Franklin D. Roosevelt was in the White House." The beloved president had served four terms, and during that time, guided the United States through both the Great Depression and World War II. Grieving Americans worried about how the future would unfold without him. Harry S. Truman, a man who hardly knew Roosevelt, and knew even less about the administration's war plans, became the 33rd president of the U.S. During his presidency, Truman was forced to make several monumental decisions, not the least being the decision to drop an atomic bomb on Hiroshima. The Japanese surrender marked the end of the Second World War. The Japanese surrender brought sudden peace to the world, and the U.S. emerged from the war as a global power. Americans were not accustomed to thinking in global terms, and for the rest of the decade the U.S. struggled to find her place as an international power. International tensions remained high after the war was over and Germany was divided into East and West Germany. Eventually, the tensions would grow into the Cold War between the Soviet Union and the U.S.
Advances in technology, including the use of radio and television for news and entertainment, forced Americans to think more about the country's role in global affairs. The 1940s was a decade that transformed the lives of millions and set the tone for future social, political and economic reforms in the U.S.
After years of struggling through the Great Depression, the U.S. entered the 1940s a weary and wary nation. The country resisted joining the war in Europe, even as the European democracies fell one at a time. FDR was able to assist Britain through the Lend-Lease program, where the United States "lent" 50 older destroyers for leases on British bases. Initially chastised by American isolationists, opposition disappeared after the Japanese bombed Pearl Harbor on December 7, 1941. Roosevelt quickly mobilized the public's support and committed the United States to total war. World War II defined the decade and would monopolized the nation's attention until the Japanese surrender in 1945. The Pittsburgh Courier launched the Double V Campaign. Although the U.S. was fighting overseas in the name of freedom and democracy, at home, both African-Americans and Japanese-Americans suffered great civil rights injustices. Thousands of African-Americans willingly joined the military to fight for freedom, yet at home, they continued to suffer from segregation and racism. The Pittsburgh Courier launched "The Double V Campaign." Under the theme of "Democracy: Victory at Home, Victory Abroad," the effort to rally African-Americans and raise awareness about civil rights issues was very successful. The campaign spread to all parts of the country. In 1942, Roosevelt ordered the War Relocation Authority to relocate hundreds of thousands of Japanese-Americans to internment camps. The administration was afraid Japan would attempt to orchestrate an attack on the Pacific Coast using Japanese-American spies who lived in the U.S. Many of these individuals were, in fact, U.S. citizens. They were forced to close their stores, leave their jobs, give up their houses, and live in arid relocation camps far from the Pacific coast. 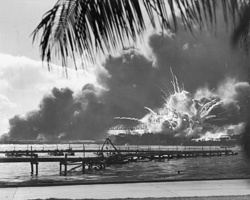 On December 7 at 7:55 a.m., Japanese planes began dropping bombs on the U.S. base in Pearl Harbor, Hawaii. The attack was sudden and devastating. More than 2,400 people died. The very next day, all Americans listened to the radio as Roosevelt declared war on Japan. Hitler never knowingly let his normal voice or conversations be recorded. As Fuehrer, he permitted recordings only of his carefully staged and rehearsed, formal speeches, delivered in a dramatic and high-pitched voice. But after Hitler delivered such a speech in Helsinki during 1942, a sound engineer left the recording equipment running and captured a private conversation between the dictator and Finnish leader CGE Mannerheim, a Nazi ally. Hitler, in his rarely heard, low-pitched normal voice, confides to Mannerheim things such as, "Had I finished off France in '39, then world history would have taken another course. ... But then I had to wait until 1940. Then a two-front war, that was bad luck. After that, even we were broken." Sound engineer Thor Damen was almost executed after the Gestapo realized what he had done, but Damen managed to fool them into thinking he had destroyed the recording. According to The Guardian, "It is the only one in existence where Hitler speaks freely," says Lasse Vihonen, head of the sound archives at Finnish public broadcaster YLE, which operates Radio Finland. Hitler's voice secretly recorded (audio) Please note that the first 30 minutes of the track are commentary from Finnish journalists. General Dwight D. "Ike" Eisenhower's plan for a cross-channel invasion, code-named "Operation Overlord" was launched by the Allied Expeditionary Forces on June 6, 1945. Allied troops reached the beach near Bernieres, France and poured ashore on the Normandy coast. The tragic news of Roosevelt's death was first heard on the radio. Listeners were jolted by broadcast interruptions, and a shocked nation struggled to come to terms with the news. Americans first learned about the atomic bomb 16 hours after it was dropped on Hiroshima. Truman interrupted regular programming to announce that the Japanese "had been repaid many-fold" for their attack on Pearl Harbor. Even after two bombs had destroyed two Japanese cities, and killed thousands of Japanese citizens, Japan's Supreme War Council remained deadlocked on the issue of surrender. The Council turned to Emperor Hirohito for a decision, and it was Hirohito who announced Japan's surrender on Japanese radio on August 15, 1945. The U.S. began broadcasting the news on the radio around midnight. Originally created to investigate the Ku Klux Klan and to search out Nazi and fascist plots within the United States, the House Committee on Un-American Activities (HUAC) refocused its attention on searching for communists, and it found them in the form of Hollywood 10, a group of writers, directors and producers who would refuse to testify before the committee. Others in the motion picture industry did choose to testify, and the Hollywood 10 would be "blacklisted" in Hollywood because of it. 1948 — "Dewey Defeats Truman"
Truman was a serious underdog in the 1948 presidential race. Despite predictions that Tom Dewey would sweep the race, Truman won 303 electoral votes, and a four-year term in the White House. Network radio and television stations were able to flash the news that Truman had won; however, the print media was one step behind. On the morning of November 3, 1948, The Chicago Tribune embarrassingly proclaimed "Dewey Defeats Truman". Wire services, newspapers and broadcast organizations sent correspondents to Europe and Asia to report on international developments during World War II. Unlike previous wars, this war was broadcast daily to a listening audience back in the U.S. The radio played an important role and helped to radically change how people received news and entertainment. The "Murrow Boys" broadcasts from Europe brought the war closer to Americans back home in the states. CBS set a news standard that followed its journalists into television and lasted for decades. The 1940s were the last decade in which radio was dominant. Television had become a viable technology in the late 1930s, but technical delays and the war both stopped widespread introduction until the late 1940s. After the war, the broadcast networks poured large amounts of money into television. Television began a media revolution in the late 1940s, transforming America, and opening the nation to whole new world of visual communication. Comic books became successful in the 1940s because they provided cheap and exciting entertainment. Superheroes flourished during a time in which evil was all too real in the world. Captain Marvel, Captain America and Batman battled evil and fed the imagination of the youth. Comic books were also very popular in the military for two reasons: one, the soldiers of World War II were young; and two, comic books were easy to carry. During WWII the government was actively involved in monitoring media and encouraged the media to send patriotic news messages. The Office of Censorship requested that news institutions adhere to a strict voluntary censorship code, and also began monitoring news entering and leaving the country. Although, The War Department directed most propaganda broadcasts at Germany and Japan, propaganda techniques were utilized to in the U.S. as well. Major motion picture producers cooperated to produce war films, and journalists in radio and television willingly submitted stories for approval. This site was built by students in Rick Musser's Journalism History class as a study aid. While both the teacher and the graduate students who prepared the site have tried to assure that the information is accurate and original, you will certainly find many examples of copyrighted materials designated for teaching and research as part of a college level history of journalism course. That material is considered "fair use under Title 17, Chapter 1, Sec. 107 of the Fair Use Statute and the Copyright Act of 1976. Contact copyright@ku.edu with further questions. The material was last checked for accuracy and live links December 31, 2007. This site is in no way affiliated with any of the people displayed in its contents, their management, or their copyright owners. This site has a collection of links to other sites, and is not responsible for any content appearing on external sites. This site is subject to change.